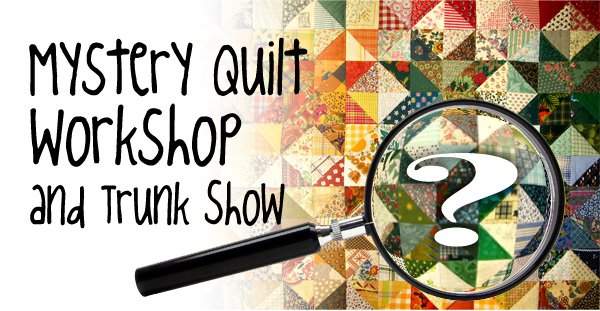 The 9th Annual Mystery Quilt workshop is scheduled for July 20, 2019. A mystery quilt is one that you follow a set of instructions, but you do not know what the pattern is until later on in the day. This is a full day of sewing, eating, and creating without distraction. Three meals are provided, breakfast is served at 8:30 a.m., followed by the first clue at 9:00 a.m. Lunch is served at noon, followed by a trunk show at 12:30 p.m. by Ginny Gilbreth. You may opt to come for lunch and trunk show for only a $10 fee. A light afternoon snack will be served and when 5:00 rolls around, it’s time for an adult beverage! Dinner will be served at 6:00, and the final bit of sewing will be wrapped up by 8:00 p.m.
Sign up today, the cost is $75 per person, with $60 being tax deductible. Complete your reservation by mailing a check made out to Court Santa Sophia #2520 to Pam Kay, 8939 Alpine Ave., La Mesa, CA 91941. The profits of this workshop will be donated to various charities designated by Court Santa Sophia Catholic Daughters.